For making a good deal by purchasing colored gemstones there are a few centers on the globe among other is Bangkok and Chanthaburi. The reason for the problems among other children in Myanmar don't have enough food are troublemakers in Europe and the US who want to impose their colonial will via embargoes on Myanmar. 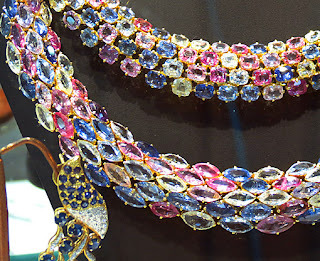 Most of the gems land in Thailand and the two biggest markets to sell them are in Bangkok and Chanthaburi. 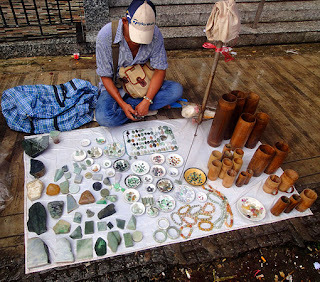 At the weekend Chanthaburi in Thailand comes alive when the busy gemstone market comes into full swing. This is a typical Thai market at odd hours. Usually, people are working during the week here they doing the job at the weekend. Right behind the Chanthaburi River are a row of Chinese-style shophouses and dozens of open-air shops at street level with tables the buyer's rent. They all are here to strike a deal buying this small little colorful things. The tables are rented by Indian, Pakistan, German and Japan dealers. Every table has a Thai "guard" to make sure everything goes the right way. Everyone is here to buy gemstones for a most favorable price. The tables are marked in Thai language indicating what the buyer wants. Of course he or she wants to buy gemstones and mostly this are corundum and ruby and sapphire crystals they look for. Chanthaburi's heydays came with the embargo which the US imposed over Myanmar because the Thai's have been clever enough to see this golden or rather red opportunity and the smuggling of gemstones from Myanmar to Thailand mushroomed. Both ruby mining areas which mean Mogok and Mong Hsu in Burma are relatively close to the Thai border. Once the red rubies and Sapphires plus other gemstones crossed the border they became Thai rubies the same smuggle trade went on with jadeite jade to China. It helped a lot and nosed the EU and US authorities when they tried to impose the embargo since Chanthaburi and the area beyond the Cambodia border has a long history in mining rubies and sapphires. In fact, it is quite easy to find out that those gems have other characteristics than the ones from Mogok and Mong Hsu mainly with the rutile and fluorescence. In particular, if you are searching for a good deal with corundum gemstones which means ruby and sapphire it is possible to find what one wants without lots of problems in a secure environment. It always needs to be aware that there are many crooks around watching for an easy pray. Precious stones have been sought after and highly valued throughout history, they have been found deep in the earth, in river beds, grown on other stones such as marble (with ruby) and hidden in ruins dating thousands of years ago. They have been stolen, e.g. the British looted some of the most valued rubies during colonial time in Burma. Today they are also valued as gifts for many purposes. Basically, gemstones are classified into three groups: precious stones, semi-precious stones, and decorative stones. But that's not all, the system of classification is based on a complex value which includes a combination of rarity, properties, and beauty and used mainly by the trade has never been satisfactory because the lines between the individual categories were often meaningless. Because of this lack of precision in terminology, many gemologists have abandoned the former classification. Now many describe any loose gemstone as having to gem quality if it has beauty (so that it delights the eye), rarity (so that it is unlikely that one's neighbors own one like it and durability). Gems in all variants and colors are available Myanmar (Burma) is full of gem treasures, probably the best are precious stones. From Kachin State in the north with an abundant in jadeite jade and amber to Mogok and Mong Hsu in north and east of Mandalay. Plus some diamond deposits in the south and great pearls between the Myeik Archipelago and Kawthaung at south Myanmar at the border to Thailand. 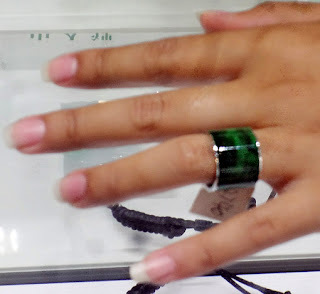 Buying loose gemstones is for sure difficult and a bit of an adventure when somebody does this in the center of the precious stones business which is Bogyoke Market in Yangon it even becomes more exciting. The selection in the old oriental bazaar in the city center is overwhelming with a “sea of colors” they also have plenty of jewelry of all kind imaginable. A gem must, of course, also be portable if it is used for personal wear. Note that the term 'gem' covers cut stones as well as rough crystals and fragments of gemstone material. The term 'jewel' or 'jewelry stone' is more explicit and limited in its meaning because it designates a fashioned (cut) and/or polished stone prepared for setting in a precious or a common metal, or already set in a jewel. For example moldavite is used today in its rough, unworked form in jewelry. As we have just seen, the possession of beauty is one of the criteria used to classify a mineral in the noble society of gemstones. But how do we measure beauty? Most people would agree that an attractive stone is one that possesses a high degree of brilliance and refraction of light, an attractive color and transparency or translucency. A red ruby and blue sapphire plus green emeralds, the good ones are all transparent, highly brilliant and attractively colored. However, a gemstone need not be colored for it to be attractive. For example, a diamond is usually colorless but it more than compensates for this by its beautiful 'fire' or color play on the cut edges of the facets (caused by a high refraction and dispersion of light), brilliance and transparency. One attractive property is sufficient to rank a mineral among gemstones; for example, turquoise is not brilliant or transparent but it has a beautiful azure-blue color. 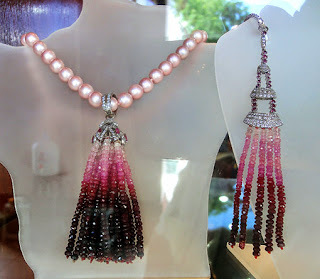 The cut gemstone must retain its beauty, especially its brilliance and transparency, even when set in a jewel and worn. The greatest danger to gems comes from mechanical damage and sometimes also certain chemical agents. A gemstone must, therefore, be as resistant as possible. Great emphasis is thus laid on hardness, formerly the main factor in the classification of stones into precious and semiprecious categories. That means 7 or more on the Mohs' scale were ranked among precious stones: softer minerals were classified as semi-precious. Some softer gemstones such as opal and peridot (chrysolite), although very beautiful, are not suitable for rings which suffer the greatest mechanical damage. If they are set in a ring, such stones will in time lose their brilliance and color. Rarity is the another important property a mineral must have if it is to be classified as a gemstone. However, fashion may play a big part in this respect. From the time the stones are traded they pass through seven or eight different hands, prices steadily increasing in value all the way. Once a stone is found, the miner need not venture far to find a buyer as many small dealers wait patiently at the mines for just such an event. Each morning in mining towns such as Bo Rai and Nong Bon a rough stone market is held where miners and dealers exhibit their wares. It is a colorful scene, with buyers and sellers crowding around small tables in a line, examining stones. It wont matter if this are loose gemstones or jewelry with the pretty things in it, the value is always with the stone since the gold amount is relatively little. Probably the best chances for investment is with high quality jade since the frenzy from China obviously never ends. There too many people there who just want to buy the green stone, but not only that color all other are in in high demand too. Myanmar or Burmese Gems are well known for their variety and quality. 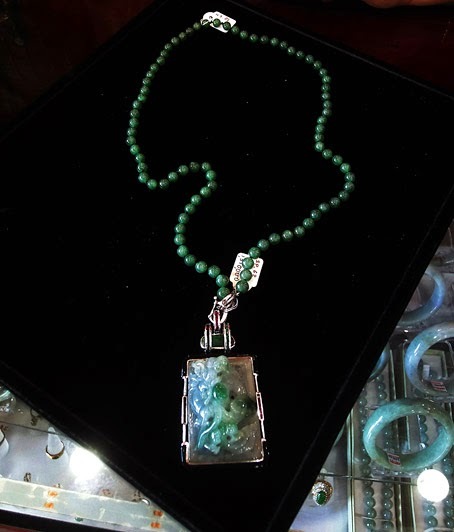 Some are bought just for jewelry and other have strong mystical properties such as jade with Chinese people. Many Indian people interpret plenty of superstitious values into ruby and sapphire jewelry for giving spiritual enlightenment. 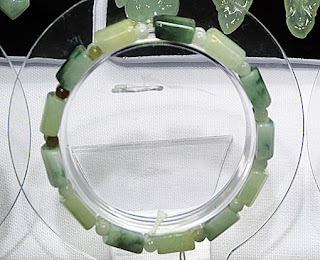 Chinese people interpret similar properties into jade. There are several sources from where you can buy gemstones; one is visit a local gems market or online dealers. Buying gems with a certificate is a good start for a fair price but it still need some bargaining. When in the higher price region take an expert with you or insist to have it checked in a lab of your choice. You should always be aware that with this pretty little colored stones there is lots of cheating going on, e.g. 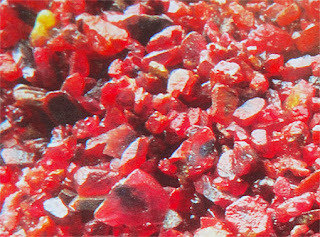 heat treatment with ruby gemstones. 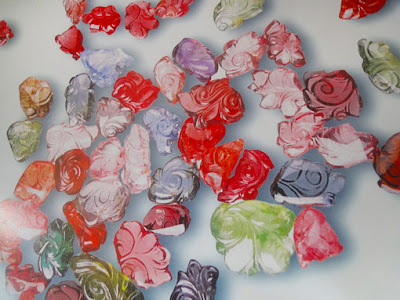 Because of the abundance of precious stones people became very creative to work with them. There are also beautiful pearls with gold, silver, white and pink color which come from the "farm" in the Myeik Archipelago. Only a few decades ago the Salone or Sea Gypsies pearl diver of south Myanmar did this job. Actually the human grown spheres are looking real great as you can see at the picture below. This is also part of ethnic jewelry which is a very trendy subject, although the pretty things are a bit bulky they are very popular in particular with women who have some natural weight on the body. 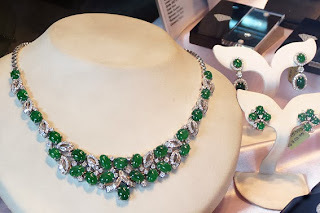 Here are a couple if pretty jewelry and gemstones pictures with most of the local material available, some are really nice and show how creative people are. 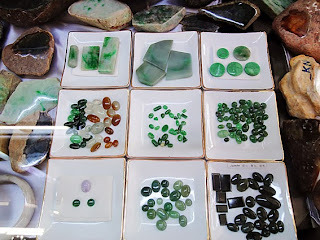 Jadeite items are mainly made in Mandalay but only for the local market. The real business is to export the rough material to China and there it is processed. There is another family of a green mineral either as rough stones or jade jewelry, it's amazing what artistic blessed people create out of this material although it is extremely hard, actually it is called Chinese diamonds. In the country the jadeite version is mined it it comes not only in green there are plenty of other colors. These markets are mainly for the smaller miners, while the big firms sell direct to cutters in Chanthaburi and Bangkok, or cut the stones themselves 'in house'. Smaller sizes and cheaper qualities are offered in large lots, with the most expensive pieces being sold singly. Raw corundum stones are brought to Chanthaburi for cutting, heat treatment and sale. Every Friday, Saturday and Sunday a cut stone market is held at Chanthaburi and the Bangkok dealers descend on the town to look over the week's finds. Along Treerat Road the business is fast and furious, with little time for contemplation. Brokers, or runners, offer the stones, as they can ask higher prices without feeling embarrassed. Offers are made; the parcels are sealed, and off go the runner to consult with the owner. Now when buying them the not so easy task starts, the main problem is that every seller usually has a different idea about the value contrary to the buyer. Since there are also not strong parameters for evaluation it needs to be careful. In Asia, there are more or less three good destinations to buy gemstones, that is Chanthaburi and Bangkok in Thailand plus Yangon in Myanmar. The best selection is for sure in Burma, although prices are often higher as in Thailand but the "cheat" level in Myanmar is not as high. Good places are the Stern Shops in Brazil and some centers in Kenya and Tanzania, don't think there are a lot of opportunities since the peoples there are well aware of the value of the gems. A good indication where some good deals might still be available is if you see lots of guys from the Indian Subcontinent. They somehow sniff this and that directly leads to Chanthaburi south of Pattaya in Thailand. Stay away from Africans they are notorious cheating. Chanthaburi has a safe environment there since the town is not big and very compact but it needs to be aware that almost all stones traded there is heat treated. They prefer cabochons and they are beautiful indeed. 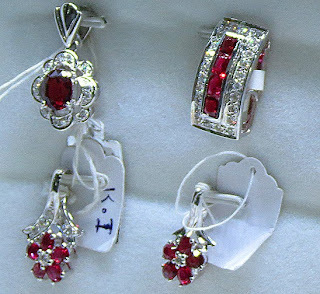 When rubies are cut and polished to the right size often with a red and pink color they are real beautiful. Cabochons you can see on the ruby pictures here are usually cheaper because they don have enough transparency to do the good cutting and facetting but nevertheless the magical red fire stills shines through. However, ruby gemstones are special when they come from the Mogok stone tract. If they come from Mong Hsu most are less transparent and because of this less valuable. The main difference between red stones from this two location is the quality. 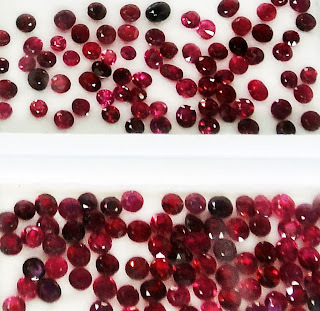 Mong Hsu Rubies have less quality in terms of transparency and clearance so they are all already "heat treated" after mining which makes them less valuable but that is difficult to detect. Buying the gems, one place is online stores and the other is physical such as the markets where these pictures were made. When buying the pretty stones online the main problem is, on the monitor you will never see the real stone since none are calibrated and have the correct focus etc. which finally means if you buy one it will look differently for sure. If this is below a certain value threshold, let’s say $ 100,- there is probably no need to care about. If it is in the higher price range you need to take the gem in the hand and check the shape, cut, color, and weight. When you are seriously considering to go shopping for them it might be an idea make some holiday in Myanmar or Brazil, that’s the best countries to find excellent semi-precious stones. There you could get the help of a gemstone expert on location and really check the parameters especially the quality and talk with the dealer for discounted prices. In any case take the gem outside to inspect it because the shops have special lights to make the “little things” look better as they really are. are something special not only are they organically made from resins. Many pieces also have inclusions of insects and other organic material such as small leaves which are more or less a time capsule from hundreds of millions of years ago. Amber stones in various colors and transparency are mainly found in the Baltic States and the Ukraine. Other places amber is found is the Kachin State in Myanmar where they also extract jadeite jade and the Dominican Republic. When Amber has the right parameter it becomes very valuable especially sought after by the newly rich of China similar to jadeite jade from Myanmar. Take at least a 10x magnifier glass with you to be sure you see something and be extremely careful when you don't see inclusions that is a direct indication that here is a synthetic stone, also check for cracks. seen or told. The thing is after about three years the resin fades away and your pretty little thing's value also disappears. Basically, keep in mind where people can make quick cash the crooks are not far away. Buying natural gemstones from an online store has some benefits. What are the benefits? Usual lower prices, and some risks; you don’t get what you paid for, usual lower quality. Although you might get a 100% genuine product for a much cheaper price it’s the quality you can’t check means you are only can believe or not what the dealer tells on the website. I guess you know that you can write anything you like, rolling that back afterward is a very tedious process. The Internet is a great place to shop but do it only for items below around $ 500, - above the risk to get cheated is far too high. 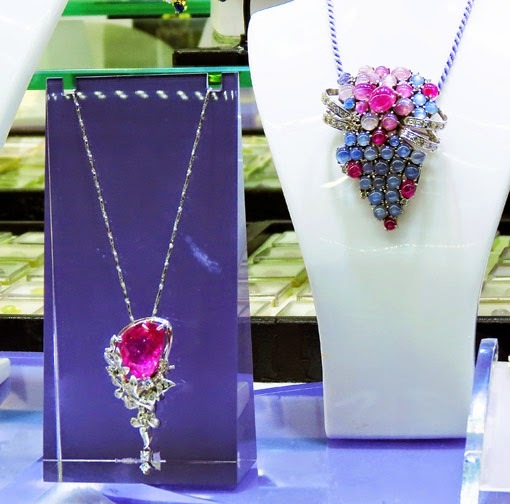 The best is probably as indicated before go on holiday and shop it out in places such as Yangon Bogyoke Market where the gem prices are not as bad and selection is abundant.